One way to find a name for your new dog is to turn to its heritage. Many popular breeds can be traced back to Irish roots. 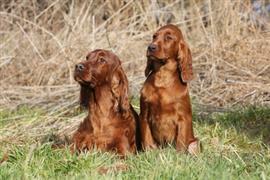 The Irish Setter, Irish Red and White Setter, Irish Terrier, Kerry Blue Terrier, Soft Coated Wheaten Terrier, Irish Wolfhound, Irish Water Spaniel, Kerry Beagle, and Glen of Imaal Terrier are all breeds with a history in and around Ireland. A good way to honor a dog with an Irish past is through the name you adopt. Our list will provide you with a number of ideas including top male and female Irish names along with several of our personal favorites. Among the top names for boys are Connor, Shane, and Oscar. Popular female selections include Kylie, Erin, and Chloe. Other ideas can be obtained by seeking out a descriptive word and translating it to the Irish language. A few options inspired by colors are Fionn (blond), Dearg (red), and Donn (brown). A female puppy that loves the water could be called Meara (meaning ‘sea’). A male dog that enjoys a nice romp through the forest could go by Kyle (meaning ‘woods’). Check out our full list for many more suggestions. Some of our pages will contain a subcategory. A subcategory is a slightly more specific grouping than the main topic of the page. For a subcategory, we will include a separated table of names and corresponding descriptions. An example of a subcategory of Red Dog Names would be 'Dog Names Inspired by Red Wines'. If you have any subcategory ideas for the Irish Dog Names page, we would love to hear them. Use the form below to submit your ideas.